I watch a lot of action movies. I love them. But I don't think any action movie can possibly top Die Hard. It's an awesome movie with great action, awesome characters, and a great story and villain. So, here are ten fun facts about Die Hard. With spoilers. 1. The film was based off of a book called 'Nothing Lasts Forever' by Roderick Thorp. Thorp wrote a book called Nothing Lasts Forever as a sequel to his book, The Detective. The Detective was made into a film starring Frank Sinatra, and he wrote the sequel in the hopes that they would make a film sequel also starring Sinatra. However, Sinatra turned down the idea of making a sequel. So, the part of the main character was offered to several actors including Arnold Schwarzenegger until Bruce Willis was cast, and Nothing Lasts Forever was adapted into the stand-alone film, Die Hard. 2. Bruce Willis was only considered a comedic actor at the time. Willis wasn't the first choice to play the role, because at the time, he was starring on a sitcom called Moonlighting. As a result, Willis was only considered a comedic actor, and they were unsure if he could play a believable action hero as a result. This is why early posters for the film didn't have Willis as the prominent figure. The Nakatomi Plaza was the main focus of the posters, since they didn't expect audiences to be drawn to a serious action movie starring the funny guy from Moonlighting. 3. The view from Holly's office is actually a painting. The view of the outside of Holly's office from the window is actually a 380-foot-long background painting to have the illusion of a busy city. The painting had animated lights, moving traffic, and the ability to change from night to day. 4. John's fall down a ventilation shaft was an accident. In this scene, John is hanging down a ventilation shaft, and he tries to grab onto the first vent. A stunt double was used for this scene, and he ended up missing and grabbing onto one a few levels below. Editor Frank J. Urioste thought that the footage made the scene more exciting, so he left it in the film. 5. The look of fear on Alan Rickman's face during Han's death fall was genuine. To film this scene, actor Alan Rickman was grabbing onto the hand of a stunt man, and he would be dropping twenty feet onto an air sack. However, in order to get a real reaction out of him, the stunt man let go of Rickman on two instead of three. Therefore, Rickman was unprepared for the fall, and his stunned reaction was the one they used in the film. 6. Willis lost his hearing after filming this scene. In order to make the film more realistic, the blanks that were fired were extra loud. In this scene, in which John shoots a terrorist through a table and remarks, "Thanks for the advice," the gun he was firing was too close to his left ear. As a result of filming this scene, Willis now suffers from a two-thirds partial hearing loss in his left ear. 7. Rickman was in over his head when filming his shooting scenes. Not only was this Rickman's first action movie, but this was his first movie in general. As a result, he couldn't help but flinch every time he shot a gun. This is why when Hans shoots Takagi and Ellis in the film, they cut away from Rickman's face before he fires. And in one scene, where Hans is firing a machine gun at John, you can see how much Rickman is flinching. 8. The German spoken in the film was mostly gibberish. Despite the terrorists being German, most of the actors playing the terrorists were not really German. So, as a result, a lot of the German you hear in the film is either very poorly pronounced or gibberish. 9. Nakatomi Plaza was filmed at Fox Plaza, the headquarters for 20th Century Fox. The building that John McClane fights the terrorists in is actually the headquarters for the company that owns Die Hard — 20th Century Fox. While the movie was being filmed, the building was still under construction, so whenever you see John walking around a construction set, that's a REAL construction set. The building also briefly appears in Lethal Weapon 2. 10. The movie's title is translated poorly in other countries. 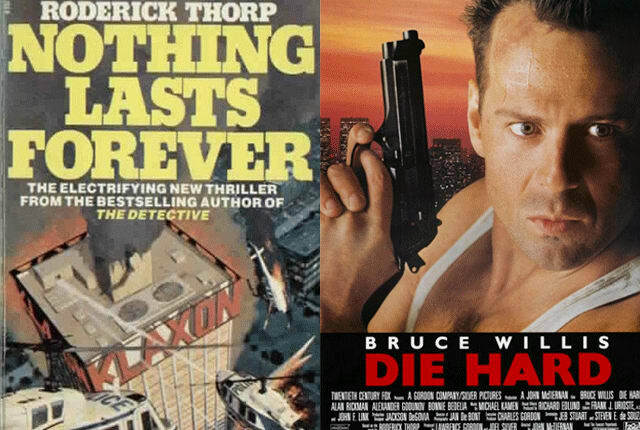 In English, you have a badass title like Die Hard. But in Spanish, they couldn't just call it Morir Duro. In Spanish, the film was called Crystal Jungle, in Poland, it was The Glass Trap, in Hungary, it was Give Your Life Expensive, and in Norway, it was Action Skyscraper. So, in terms of film titles, I think the Americans win this one. And that's it! Who wants to re-watch Die Hard right now?! Read next: 'Infinity War': Who Will Die! !